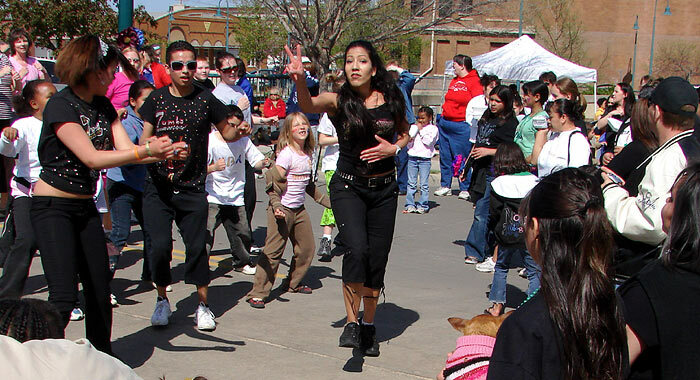 Hutchinson Kansas held its annual Cinco de Mayo festival this past weekend. I have often heard that this is the Mexican Independence Day. It isn't - that's actually September 16th. Cinco de Mayo is more of a celebration of Mexican culture, and seems to be a bigger deal in the U.S. than in most of Mexico itself. 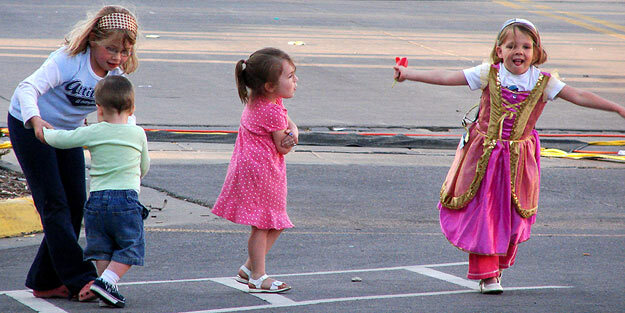 I hadn't shot Cinco de Mayo since 2006, when I ran one picture of three girls in dresses. As sort as that post was, it is hit often. 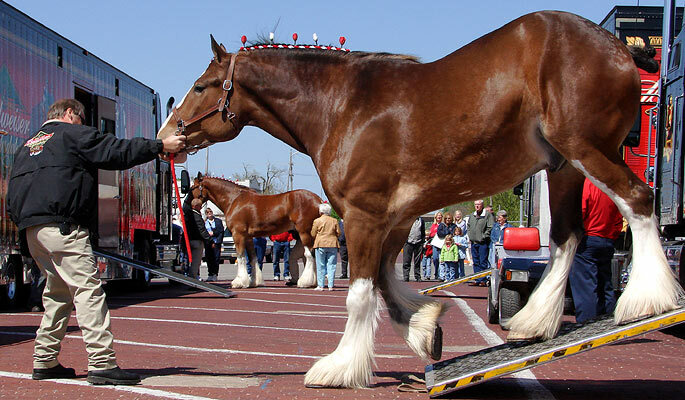 The Budweiser Clydesdale horses were in town for several functions, including an appearance downtown for the festival. I know little of horses, but I can tell these are big. The one on the left was restless and tossed his head a lot. The horses were gathered for a short pass down Avenue B and then a brief trot down Main street. 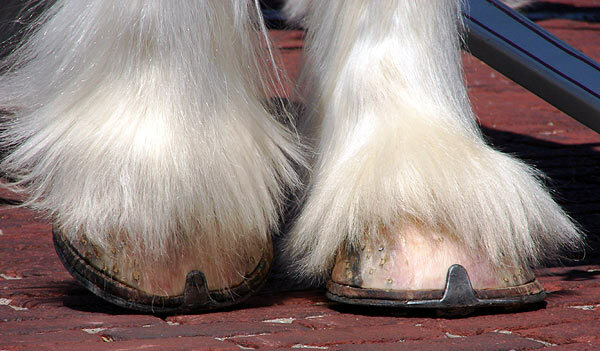 I liked seeing the hooves against the bricks on Avenue B. 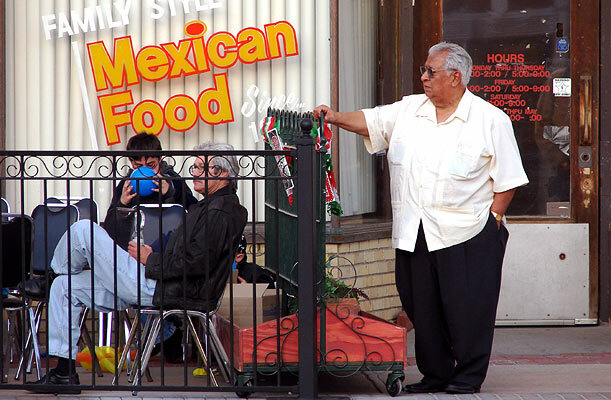 Main Street was blocked-off to traffic between Avenues A and B. Tony Flores, owner of the Mexican Restaurant on that block, the Anchor Inn, watches the festivities. The "Anchor", as locals call it, debuted its recently completed repairs. 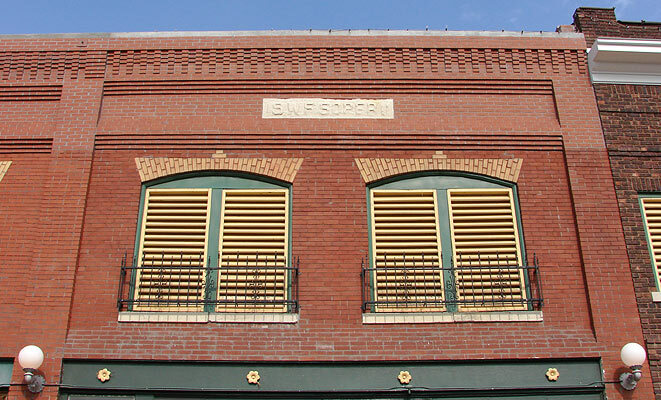 In 2006, the top front of the center building of the three that comprise the restaurant had pulled away and collapsed. Nobody had been injured, but proper restoration took some time. Here's the affected section on February 2, 2006, soon after the damage occurred. See more, here. I've always liked the range of color available in the northern section of the restaurant. 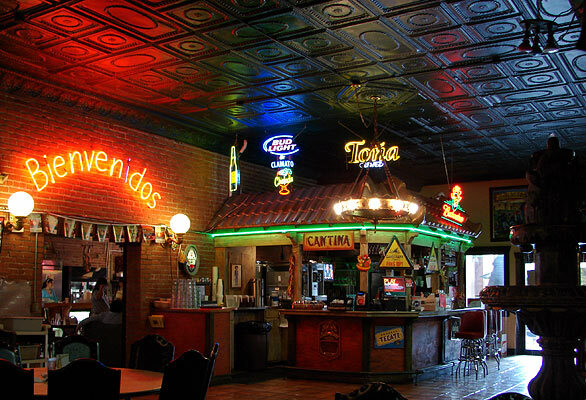 It's a big place, having grown and taken over two adjacent buildings - sort of a Mexican restaurant manifest destiny. 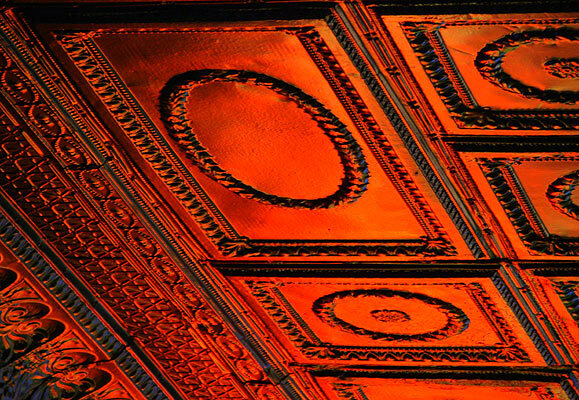 I am enamored of ceiling tiles these last couple years. Here are some of the Anchor's, lit by the "Bienvenidos" (welcome) sign. 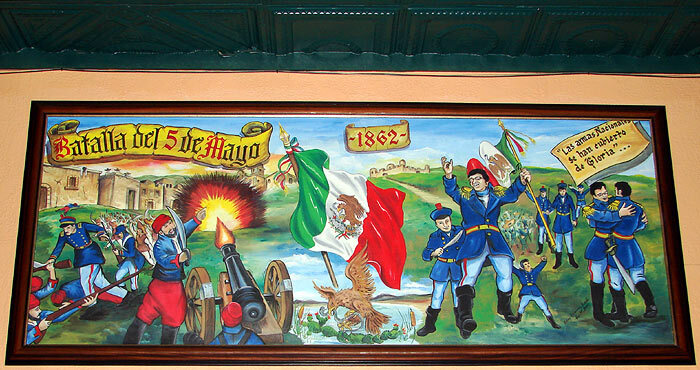 This mural above one of the doors commemorates Cinco de Mayo - the 5th of May - on which date in 1862, Mexican forces led by General Ignacio Zaragoza Seguín defeated French forces in the Battle of Puebla. This only delayed the French, and they took Mexico City a year later. Tides turn, however, and the French were eventually ousted in 1867. 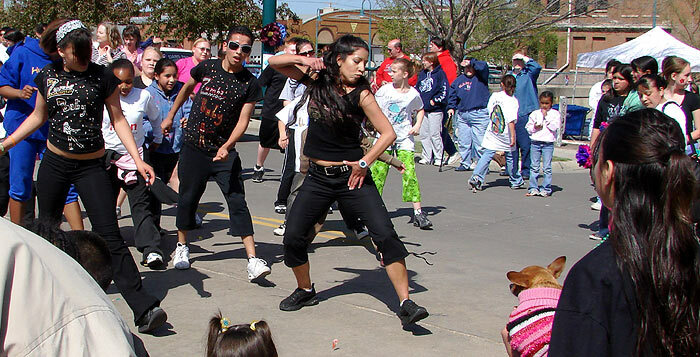 There was dancing on the blocked-off Main Street. 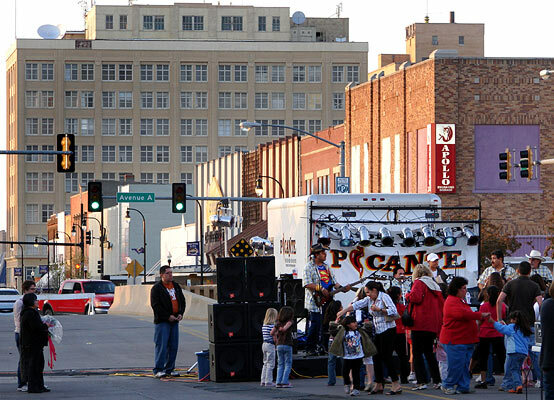 The band Picante played music for the evening street dance. The huge building in the background is the Wiley Building, an endangered building and the subject of current controversy in Hutchinson. 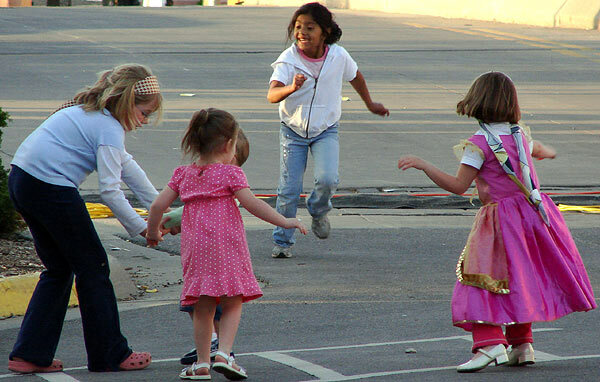 As I saw this photo on the viewfinder, I realized how different our downtown would look without it. 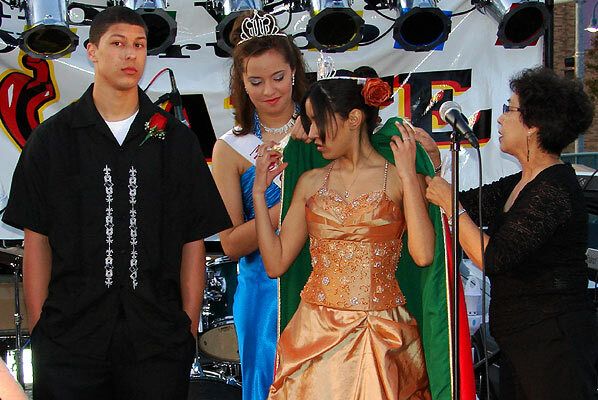 As evening fell, the King and Queen of Cinco de Mayo were crowned. 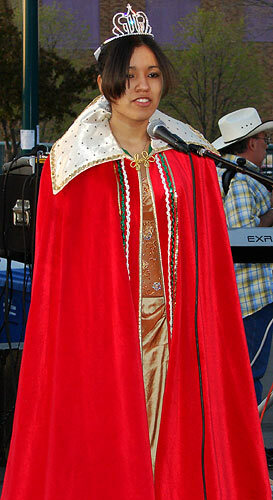 The King was Tanner Flores and the Queen was Alyssa Hill. 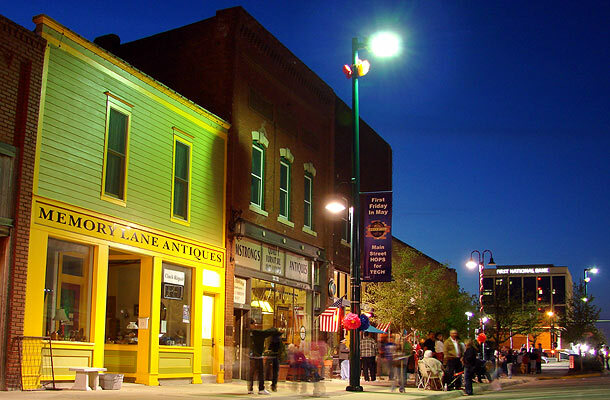 As the night wore on, folks hung out in the streets talking and doing that small Town people-watch thing. This is the east side of Main Street. This is the west side of Main. 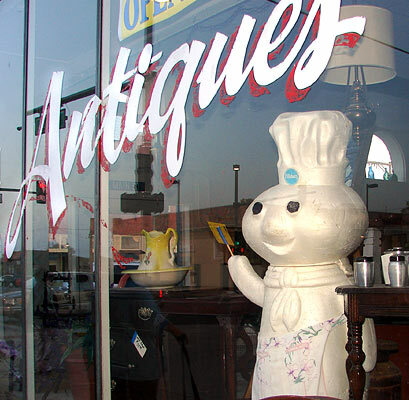 As we meandered home, a Styrofoam Pillsbury dough boy waved from an antique store. And a good time was had by all.